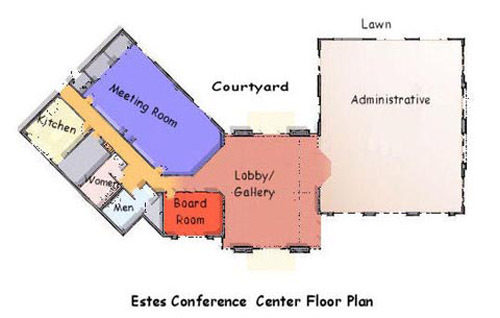 The meeting wing of the Stead Center is named the E. Harvey Estes Conference Center (ECC), in honor of E. Harvey Estes, M.D., who oversaw the Duke University PA Program in 1969 and is credited with propagating the PA concept across the nation. 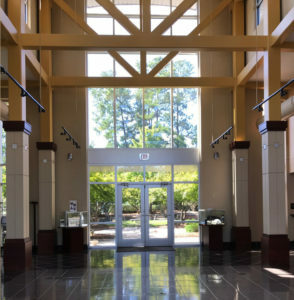 Main lobby of building and view of the courtyard, located directly behind the building and accessible from the lobby as well as the conference room. The ECC is a meeting space conveniently located just off I-40 at 1121 Slater Road in Durham, NC. 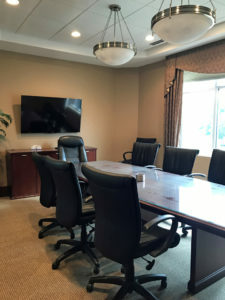 The space features a large conference room, a boardroom, reception areas in the lobby, and a private courtyard. Our typical hours of operation are from 9am to 5pm, Monday through Friday. seats 30 at classroom tables, with existing rectangular tables; up to 48 if additional nine tables are rented. 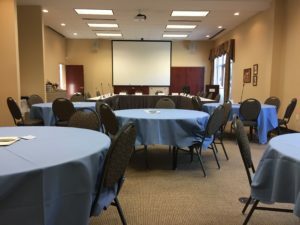 Conference room rental includes a podium, tables and table linens. Existing table options include up to eight round tables and/or up to fifteen rectangular tables, allowing for a variety of configurations to fit your needs. If your needs require a larger classroom style, additional tables can be rented for an additional fee. All room rentals are subject to a 20% service fee, but no sales tax. Payment is accepted by check only. A 50% deposit is required at the time of booking, with the remainder due on the day of the meeting. 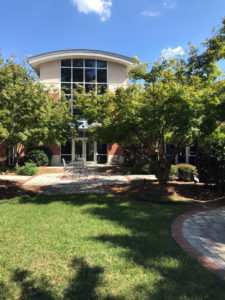 If you have questions, please reach out to us at meetings@ncapa.org or call us at 919-479-1995. To request a rental, call us or fill out the form below, and send it to meetings@ncapa.org.